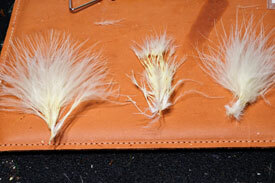 Variant - Marabou tail with rabbit body. 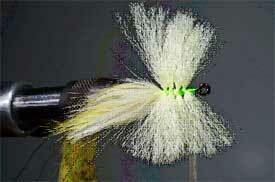 THE TARPON TOAD fly was invented by Gary Merriman, owner of the The Fish Hawk fly shop in Atlanta, Georgia. 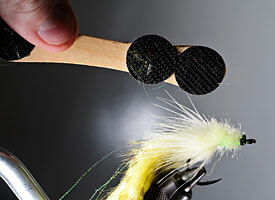 The toad is a light-weight, slow-sinking fly designed for sight-casting, and when it was introduced in the early 1990s in the Florida Keys, it immediately improved the hook-up rates for anglers pursuing skittish fish. The original Toad employed a rabbit strip for the tail. 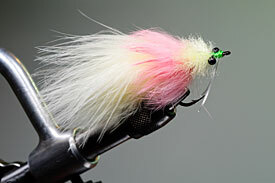 Later, the fly was changed by Captain Tim Hoover when he tied Toads with marabou for Andy Mill. 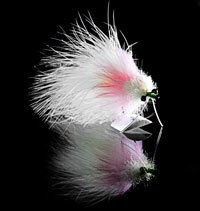 Now, the marabou version is probably more popular than the original. 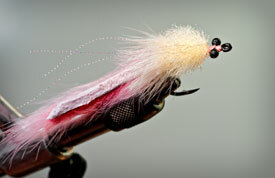 I recently spent some time with Gary and learned about the history of the fly and the proper tying techniques for success. Below is the recipe that gathered from my visit with Gary. It includes step-by-step instructions for tying the pattern, as well as suggestions for several variations. 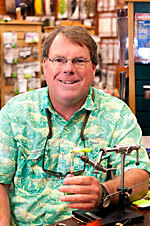 Tarpon Toad author Gary Merriman in his Atlanta, Georgia fly shop. Other: Black/red, black/purple, pink/flesh, or ask your local guide for location-specific colors. The mono eyes should contrast the general color scheme. If the body is darker, like rust, then green eyes are a good contrast/compliment. If the body is lighter, like off-white, then black eyes are a good contrast/compliment. 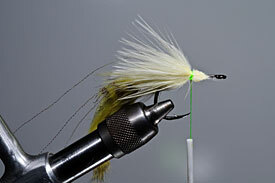 Tie the fly sparse. 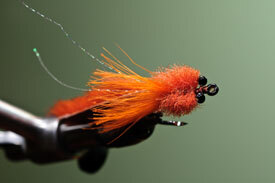 Remember, this is a slow sinking fly which should be full of life and action. 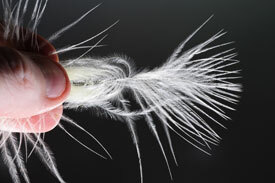 If you add too much bulk or too many EP fibers, the profile will be less effective. 1. 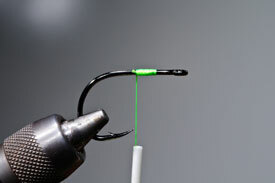 Start the thread base to only half the length of the hook, end at the hook point. 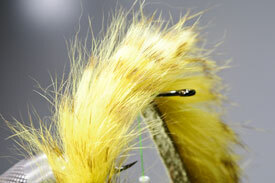 This leaves room at the back for the tail and keeps the rabbit fur from fouling. 2. 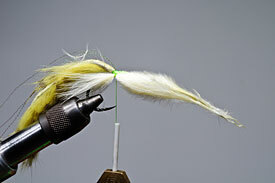 Cut the rabbit strip to about 3 inches or 2.5 times the length of the hook. 3. Tie in the rabbit strip at the hook point. Use only a few wraps and avoid bulk.. 4. 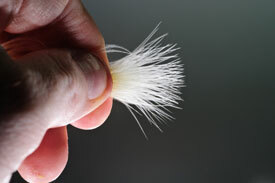 Then lift the rabbit strip and make about 8-10 wraps around the base of the material similar to a parachute post technique. 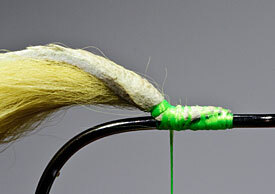 This will lift the material off the hook and keep it from fouling on the cast. 5. Now you are ready for the marabou. It is important to choose the right material at this step. 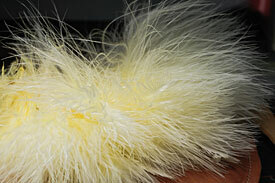 You want good quality marabou fibers. 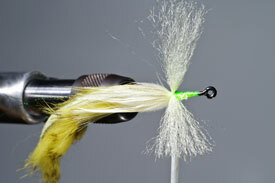 Pull out two blood quills and stroke them find the light billowy fibers. 6. 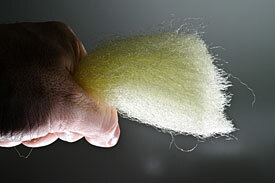 This is what you want — a small clump of fine fibers without bulk. 7. This is how you accomplish the task: Take the quill and find the point barb, then pinch the tip and stroke the fine feathers backward. Then cut off the barb and discard. Then restroke the feathers back in to place. The end result should be a nice small clump of angle-like feathers. 8. You want a quill like the one on the left. Avoid quills like the one in the middle. 9. Next, tie in two (or three) strands of flash. (Not too much, keep it simple.) 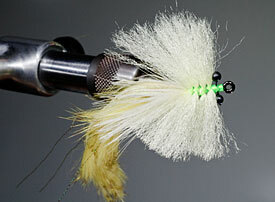 Then, tie in a small clump of marabou on the bottom of the fly. Make sure to avoid excess length on the back. Aim for something like 1/2 the length of the hook. 10. 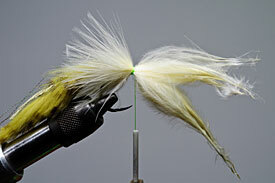 Now tie a clump of marabou on the top. 10. Next, cut off the excess marabou in the front and be careful to avoid bulk. It is best to cut at an angle here. Wrap tight once finished but (you guessed it) avoid bulk. 11. Now prepare the EP (Puglisi) fibers. You want to pull of a very small bunch, something like half the diameter of a standard pencil. Err on the side of smaller. 12. 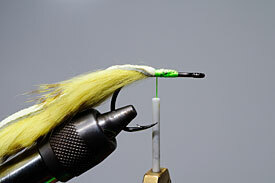 Next, tie in four separate strands over the top of the fly. 13. Center the strands and secure with a Figure 8 wrap. I make only two wraps each direction, followed by three wraps in front. Cut off the fiber clump at the end of the wrapping but make sure to leave a small amount of extra length on the side (you are going to trim it down later). Do this step four times and make each section tight (i.e. very close) to the previous tie in. 14. 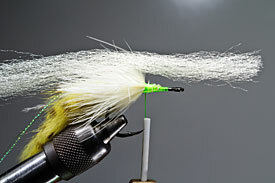 This is what the fly will look like once you complete four wraps. 15. Next, tie in the mono eyes in front of and tight to the last section of EP fibers. 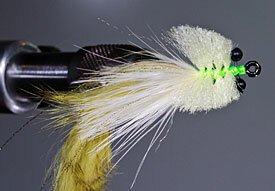 Use green eyes for darker flies and black eyes for lighter flies. 16. Next, trim the fibers in a rhomboid shape with a slight flare-out toward the back. Note: it helps to first pull the entire side clump tight and perpendicular first before trimming with one quick motion. Make sure the two sides match. 17. As a final touch, scuff up the side fibers with a wire brush or Velcro tool. Whip finish and cement the head. You’re done.